Since arriving in George Town, the near-perfect mix of socializing and doin’ our own thing has made our stay particularly wonderful. We were bummed to bid farewell to m/v Soulstice– I mean I was going to get on that SUP any day 🙂 but….. 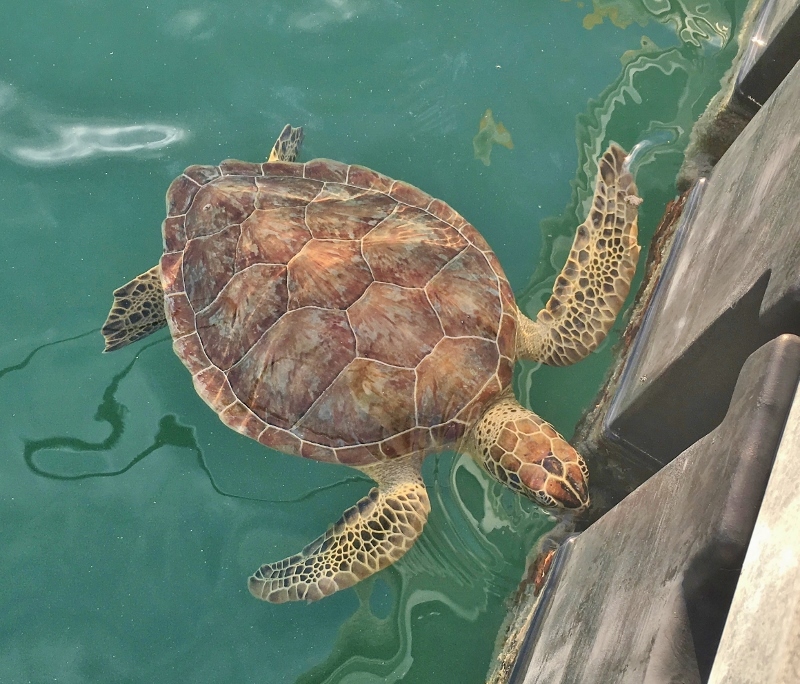 In the meantime m/v Apollo II returned from a stay at Emerald Bay marina a few miles north of Elizabeth Harbour. The VHF is very busy with hundreds of boats (307 as of 2/27) and I can guarantee that we aren’t the only ones who listen in on conversations when they promise to be “interesting”. 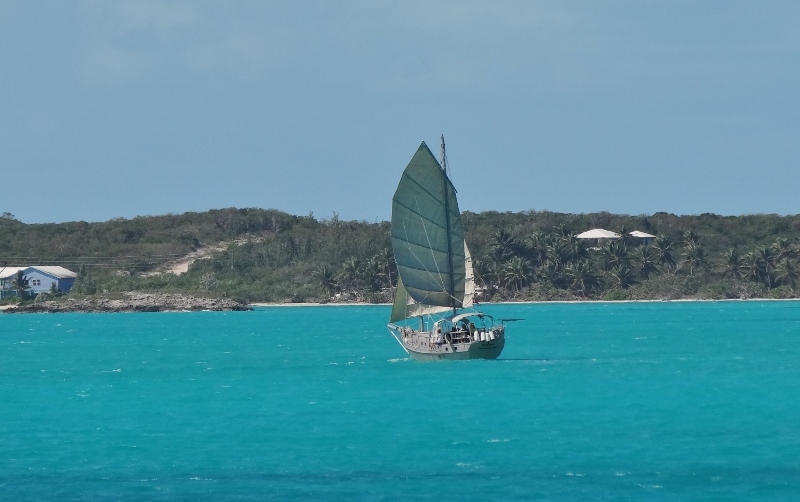 For those who we “connect with” and want to keep in touch with, email is the preferred and easy method while in this Bahamian paradise. Apollo II would be leaving (for good) in couple of days and by some miracle and twenty emails we both ended up in Red Shanks. Their draft is less than ours and being 33’ x 12’ they like the calm and comfy anchor spots too. We spent a delightful couple of happy hours with them, sharing information about Lake Champlain and Eleuthera. Talk of them trading up to a larger (maybe a power cat) boat had us intrigued. Bon voyage Carole and Jean (you Americanos- do not say Jean as in Blue Jeans, say it Jawn with barely the N sound). For those paying attention, the above covered the “mission” portion of the hint I gave in the prior post. Get it? Apollo. Mission. 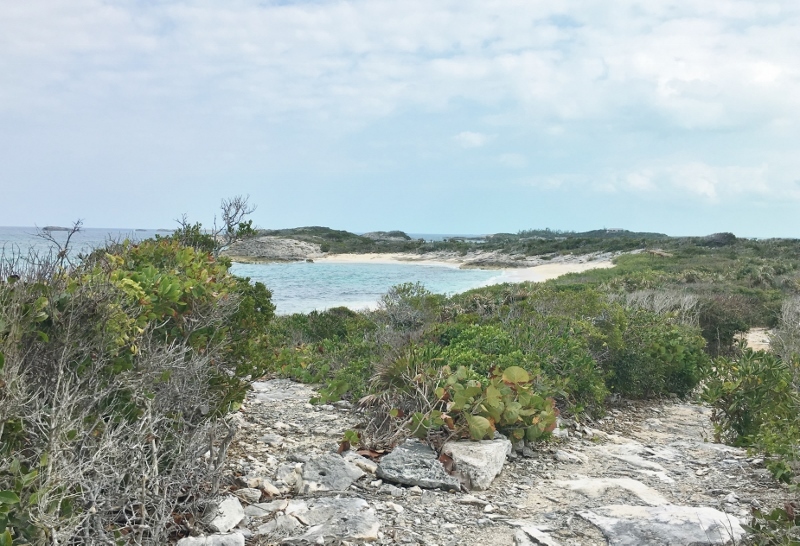 Moving right along….and up to the top of the world, or least the top of Elizabeth Island which is the medium-sized island a stone’s throw south of Stocking Island. Forgive the vague-ness of what I share about TOTW island compound; one of three properties/homes on Elizabeth Island. I am trying to respect Melanie & Paul’s privacy and still share with you the wonderfulness of this place that we have been invited to share. While we haven’t seen the other two homes, I am certain this paradise palace far surpasses. I also intend to prove once and for all that the world is a small place and the boating/cruising community the size of a mere water droplet. Bear with me while I TRY to tell a short story! Our first winter in George Town we met Matt and Tina who cruise on Mattina, a Lagoon sail cat, with their sweet dog Farley. 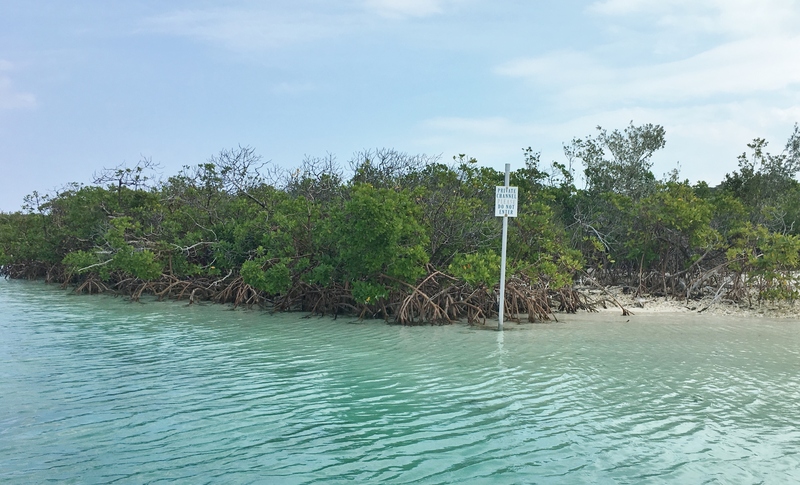 They told us that during cold fronts they went to a secret hidey-hole; a completely protected basin with a dock. Somehow we learned more and how Matt & Tina were friends with the home owners of TOTW. Boy, wouldn’t that be sweet to have no worries when the wind rapidly clocks from SW to N, often at night, and you hope your anchor can adjust. A few years ago Mattina was sold and her owners re-adjusted to full-time living in Canada with Farley. Tina won several writing awards and is now a published author. Word is that a power cat is in their near future 🙂 . In the meantime I meet a man in Exuma Market one December day a few years ago when we’d arrived before Christmas to await our son’s arrival. The Corner Store in Cuttyhunk carries an expansive collection of T-shirts and not a visit occurs when we don’t add at least one to our wardrobe. Had one on that day. Paul (the man in the market) comments and we chat. I realize he’s probably the owner of the place where Mattina went. That summer, we visit the Vineyard (MV), anchor in Lake Tashmoo and who do we meet again but Paul. 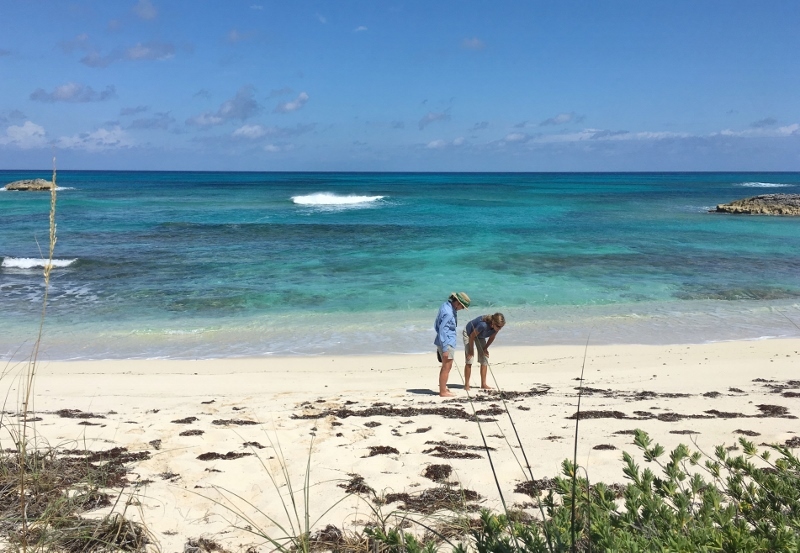 He’s now become acquainted with our friend Cort because Cort bought property on Stocking Island and plans to build what he terms “a camp house.” Still with me? Ok, jump to Jan 2017 and guess what? On the dock by Exuma Market, Russ wearing a Cuttyhunk T-shirt we run into Paul and wife Melanie. After a bit of memory refreshing on who we are (been a couple of years) we marvel at the ways we know of and about one another. Perhaps I haven’t proven “small world”; maybe the lesson is always make sure one of you wears a T-shirt from a cool place when you visit the grocery store! 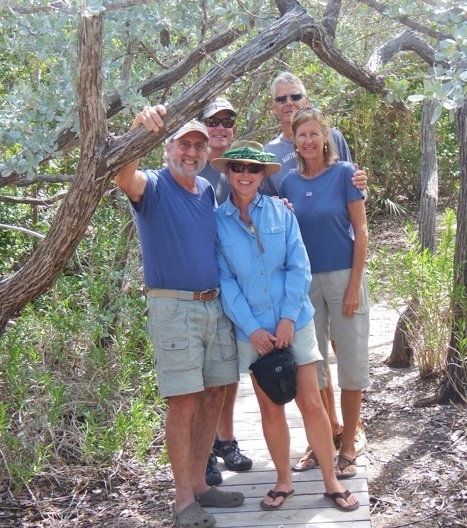 After joining Paul, Mel, Cort, Max & Giff at the Rusty Anchor to help celebrate Melanie’s birthday Feb 1 we received an invite to dinghy over for a trail walk at TOTW. 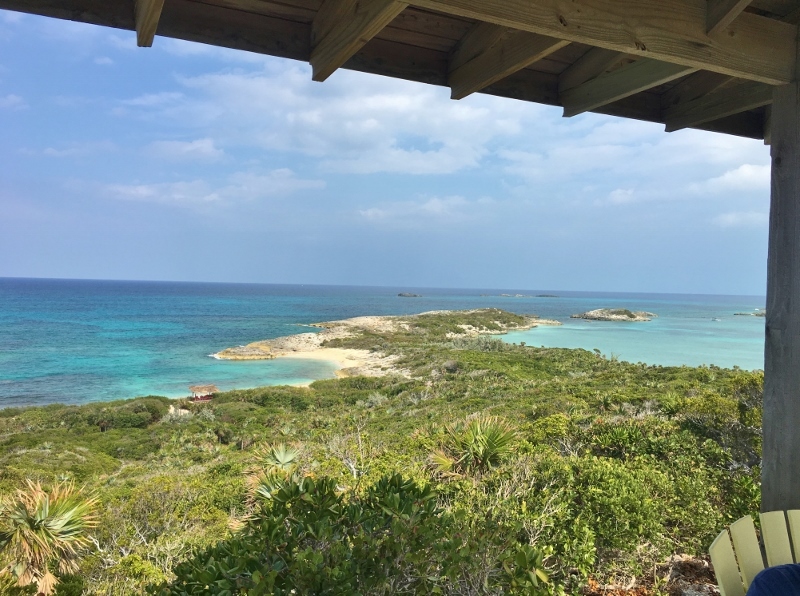 Two miles of paths lead from the Cistern House (private quarters) around to several beaches and up to the gazebo at the high point of the property, thus TOTW. Russ was still hobbled by his sciatica problem so we begged off for a couple of weeks until he could wander about with minimal pain. 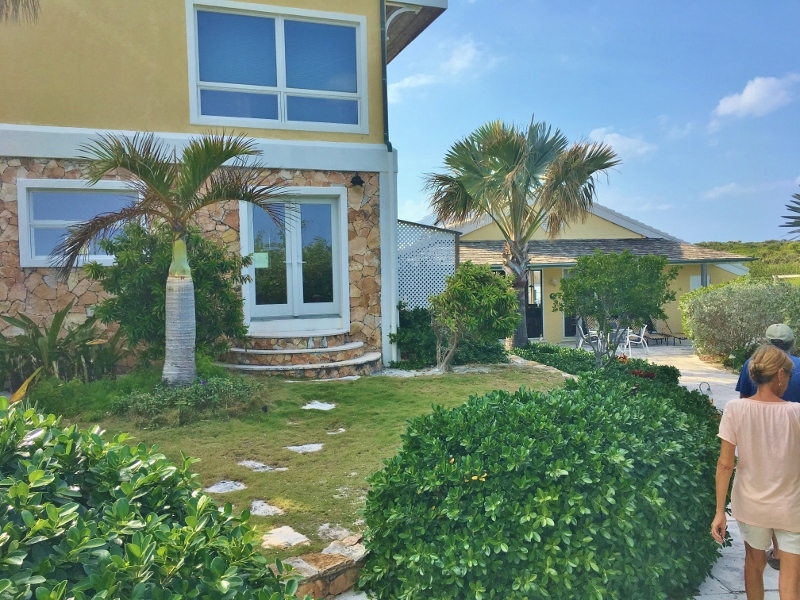 The Boat House is anything but; it houses the common areas and a kitchen to envy. 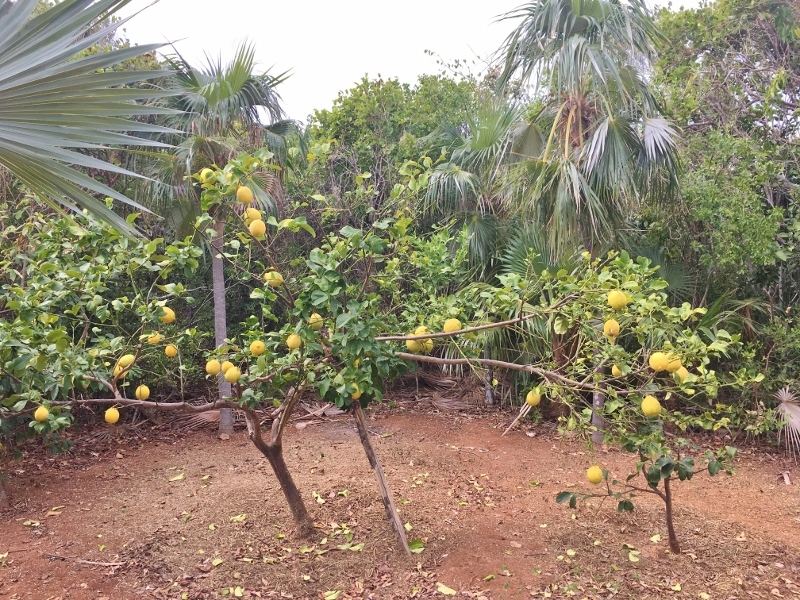 How about a garden and fruit tree grove? 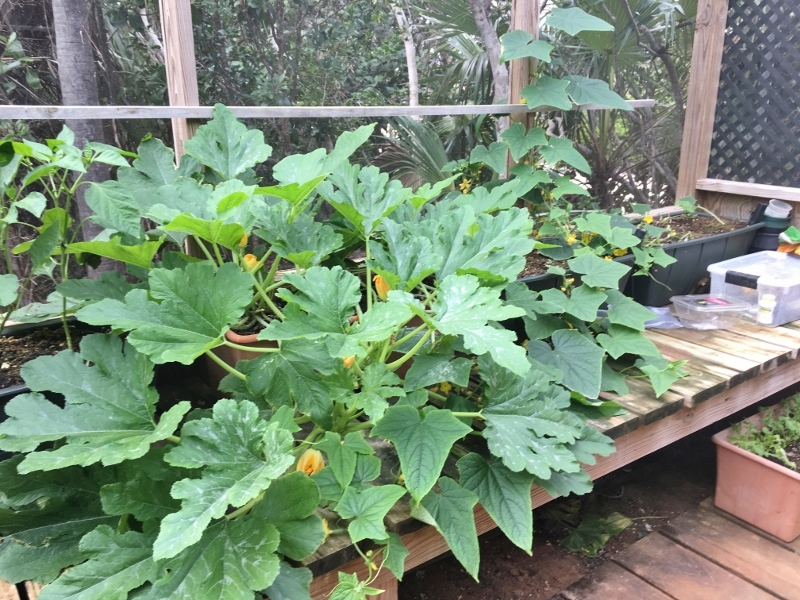 Squash in the “green house” by the fruit tree grove. Lemon tree very pretty. Fresh lemonade after a walk is a real treat. Several boats- ok four, so to be incognito at times. Solar- check. Several beaches with shaded seating- check. View south from the TOTW gazebo deck at the property high point. I’ve lost track but then after that brief one night anchoring at Sand Dollar, we headed over to Kidd’s Cove-or maybe directly up to Monument. But we ended up a few nights anchored at Monument before heading back into Red Shanks again for another nasty (rain and big wind) front. But wait, what’s this? An invitation to a CFP, aka Cold Front Party. At, are you ready- TOTW. Whoda thunk that we’d ever be bringing our big boat in? Other friends of Paul & Melanie, m/v Barefeet received an invitation too and since they were nearby in Red Shanks we stopped by to say HI and to be honest, check them out, but also encourage them to accept the invite. Erin & Chris completed a 6 year circumnavigation in a PDQ Antares in 2011 and now cruise 6 mos in a Selene trawler with 6 mos dirt dwelling in Boston. I think these guys are the first circumnavigators we’ve met. Bumfuzzle was circumnavigating around the same time but although we feel like we know Pat & Allie through Pat’s blog/website, we have never met them. So on Feb 22 we filled up B Dock and had ourselves a wonderful time. Happy hour, dinner, trail walks, beach combing and ohh and ahhing at Melanie’s extensive shell collection. Wed was a high-end potluck with Russ baking focaccia that we used to spread on Erin’s hot artichoke dip. Dinner consisted of marinated and grilled pork tenderloin, olive oil & garlic roasted potatoes and Oriental Slaw with Ramen noodles. The slaw may sound odd, but it’s really tasty. The bread was a hit; handed out the recipe and both TOTW and Barefeet baked it themselves with excellent results. Yay Russ! Erin & Lori beach comb on Second Beach. Melanie left us a few treasures. Both boats stayed a second night and another potluck was created. This time Paul provided home-made fettucine pasta and ingredients were gathered for puttanesca sauce. More bread and Erin baked a delicious Sausage/Rotel/Cheese dip, but the best part was the grilled romaine. Never had it? Us either. 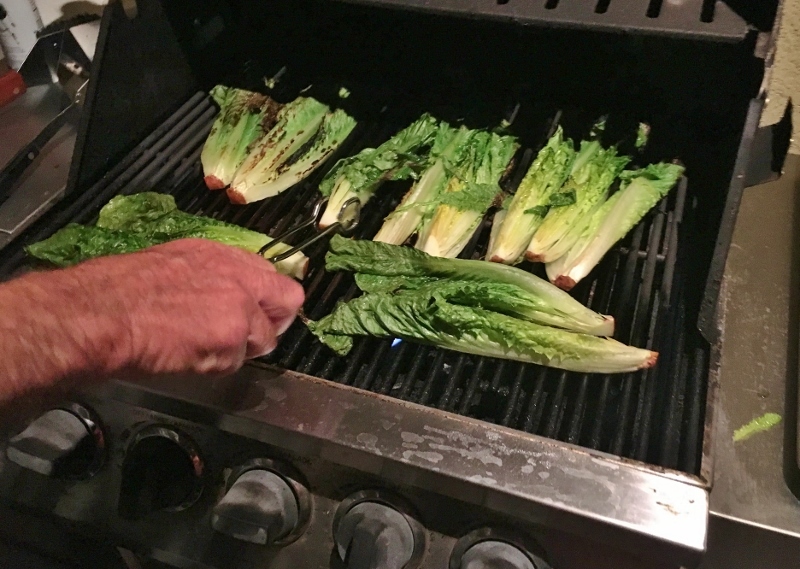 Cut up the full heart lengthwise into quarters, brush with olive oil and lightly season. Grill and serve. The flavor just pops and borders on sweet. Much more yummy than cooked spinach!! 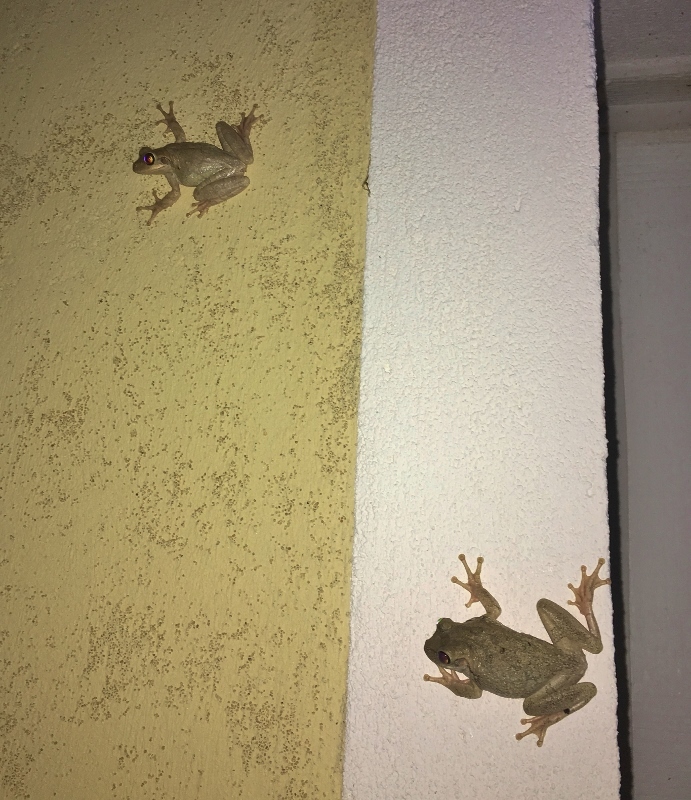 We braved the dark of night to search for ghost crabs in the swamp area but they weren’t cooperating; instead we found frogs on the house. Our daily walks did not produce a Bahamas Boa but we did surprise a couple of brown snakes basking in the sun. 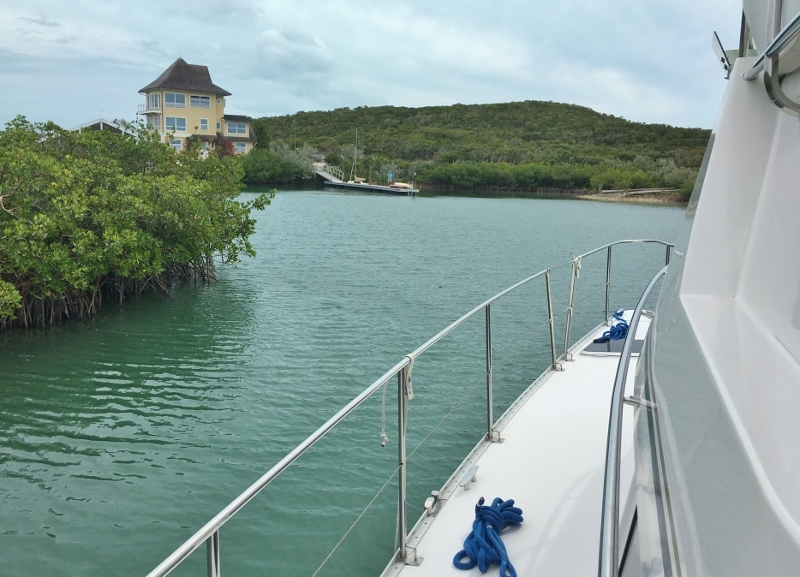 Friday brought an after lunch departure- still very brisk west winds so we simply motored across the harbor to Crab Cay Cove for the night. Another jaunt up to Monument anchorage for more paddle boarding; the board is an ideal lounge board. Russ discovered this after he spent time lightly scrubbing the bottom. We are happy with our bottom paint; working well and even without being on the move much, not much is growing down there. 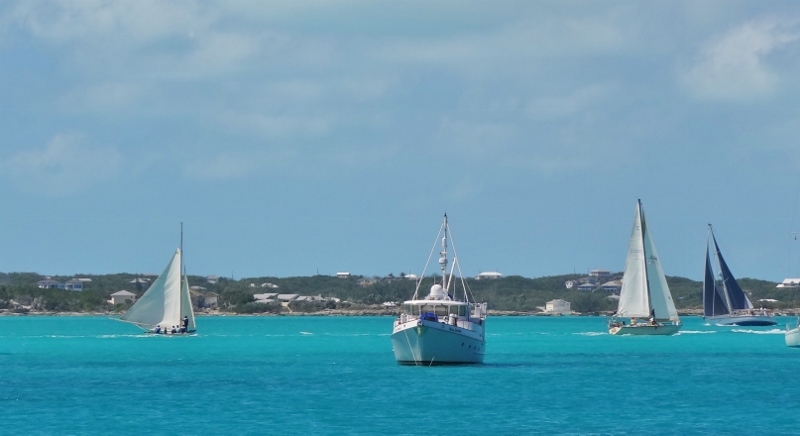 The annual Cruising Regatta kicked off Feb 24 and we had a good viewing spot for the in-harbor big boat race. Black Diamond & Red Sky battle it out. One nice day before the big NE blow that has kept us aboard for five days we went into town to accomplish a few things and enjoyed lunching with Mel & Paul at Peace & Plenty. Oh look- a PDQ34 heading for Kidd’s Cove. Wonder who? 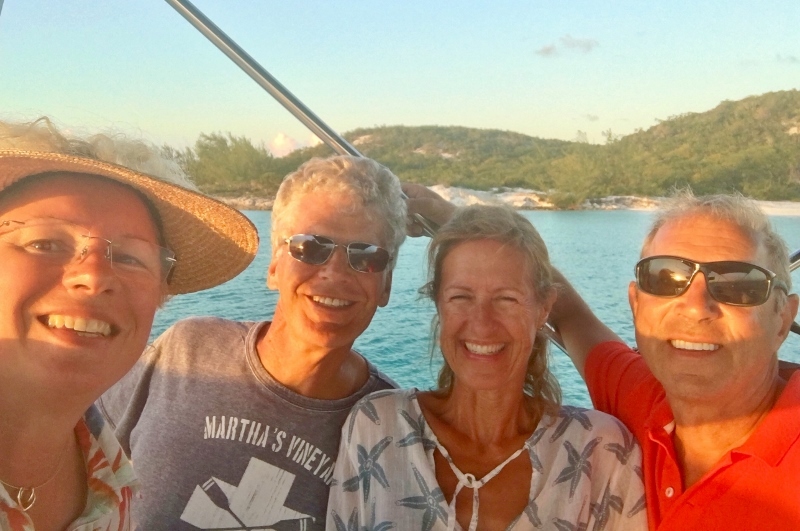 Stopped by and finally got to meet the famous Sara and Monty Lewis, creators of the Explorer Charts & Cruising Guide and the gold standard source for local knowledge throughout the Bahamas. 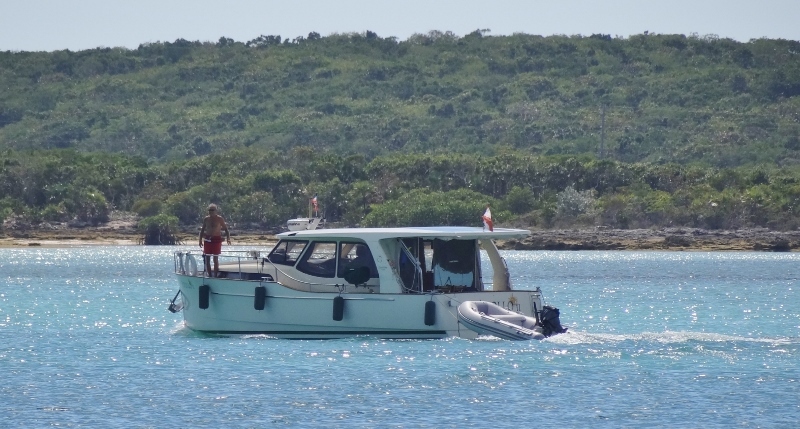 Yes, they really still cruise and check out places themselves, although the guides get updated from other sources too. Exchanged boat cards, thanked them for all they’ve done and headed off for the final regatta event: fun volley ball. Friends Cort, Max, and Fred of m/v Northstar each played on different teams. Was easier to watch the action when two were playing one another. 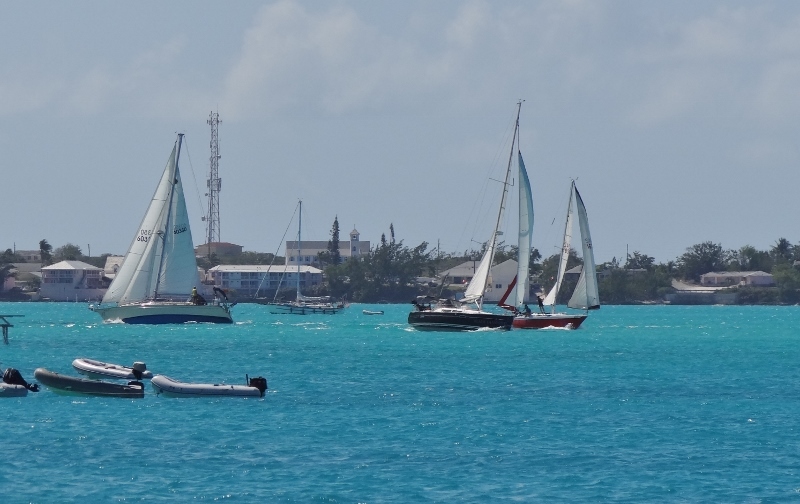 Thus ended the 2017 Cruising Regatta; March 3rd. Earlier than planned, much to the delight of those who’ve heard enough about it. 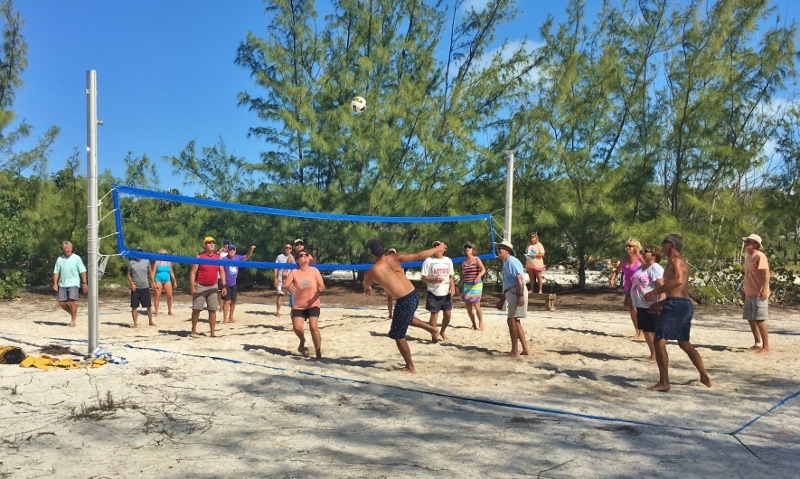 It’s a huge undertaking, involving many cruisers, Bahamians and local businesses- and too, where else can you play beach golf, beach bocci, beach volleyball, sail, scavenge and do a poker run and more? Oh and acquire a new T-shirt every year to support the Regatta. As we left Chat ‘n Chill beach, aka Volleyball Beach, I caught these words, “boat over there… lobster.” Did I move quickly? You know I did. Over by the conch shack sat a local skiff with conch and a variety of lobster tails. 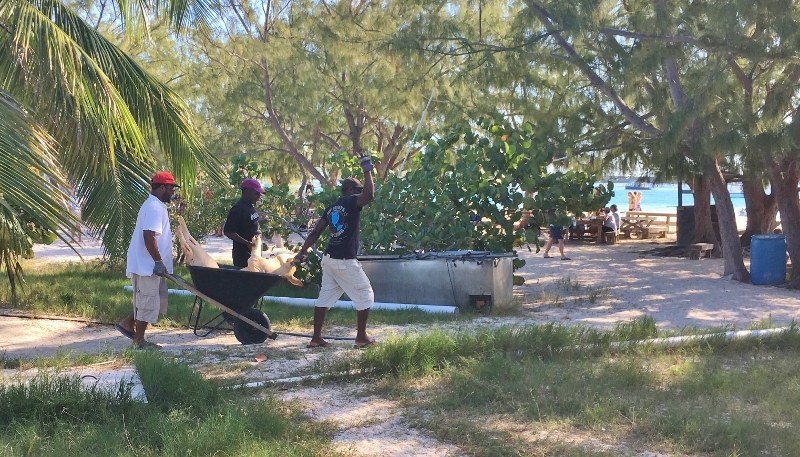 An amazingly rare sighting of a local Bahamian who’d gone diving and had plenty of fresh catch to sell. The nice man sold us two XL tails for $15 apiece; a fair price for fresh lobster as each tail would be one generous dinner. At this point our George Town stay was winding down and yet our social calendar still contained pending items. Let’s see how that all played out… in the next episode of “Making the Best of the George Town KOA” .